Although we tend to associate French porcelain with the Sèvres manufactory, first established at Vincennes in about 1740, there were many other smaller factories operating in France in the eighteenth and nineteenth centuries which produced equally beautiful tablewares and ornamental items. 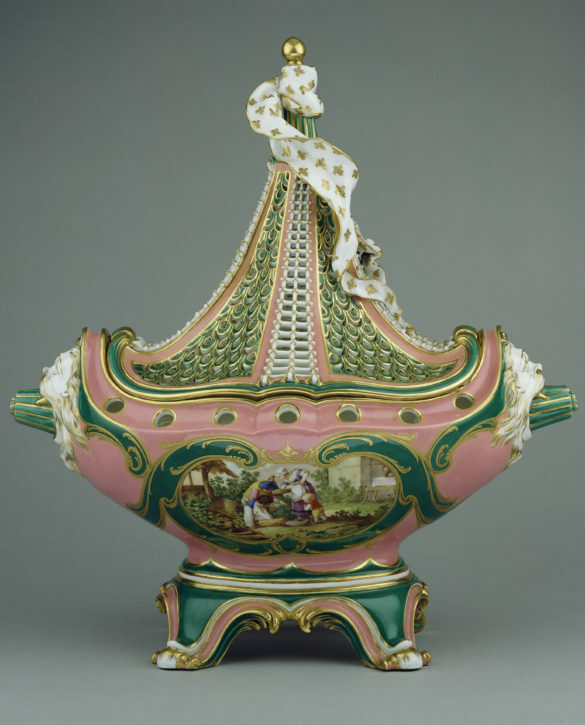 A short account of the leading French porcelain manufactories is given below. A faïence factory based at Saint-Cloud, west of Paris, was the first successful European manufacturer of an ‘artificial’ or soft-paste porcelain. In the 1660s Pierre Chicaneau (d. 1677), the factory’s owner, experimented with porcelain production. By 1693, Chicaneau’s sons had developed a commercial soft-paste porcelain from a white-firing clay fused with a glass frit (glass melted and ground to a powder). The result was a creamy white body which they covered with a lead glaze. The company received several royal privileges from Louis XIV protecting their invention from competitors. A retail outlet was established in Paris from about 1715. The factory survived until 1766. In 1730 Louis-Henry de Bourbon, prince de Condé (1692-1740) established a soft-paste porcelain factory on his Chantilly estate with Cicaire Cirou (1700-55), a faïence painter from Saint-Cloud and Paris. 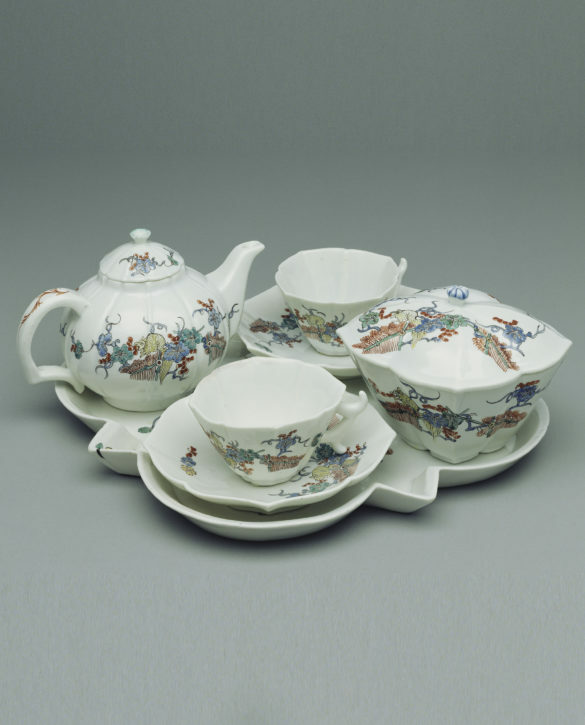 In 1735 the factory was granted a 25-year royal privilege to manufacture porcelain similar to Japanese porcelain. A milky white faïence-type, tin-opacified lead glaze was developed, not only to disguise the imperfect paste but also to imitate the brilliant white nigoshide body of Japanese Kakiemon-type porcelain. The privilege was relinquished in 1751 and several proprietors took over until the factory was finally sold to Christopher Potter (d.1817), an Englishman, in 1792. The Sèvres manufactory was first established in around 1740 by former Chantilly workmen at the château de Vincennes, east of Paris, under the aristocratic patronage of Jean-Louis Orry de Fulvy (1703-51). 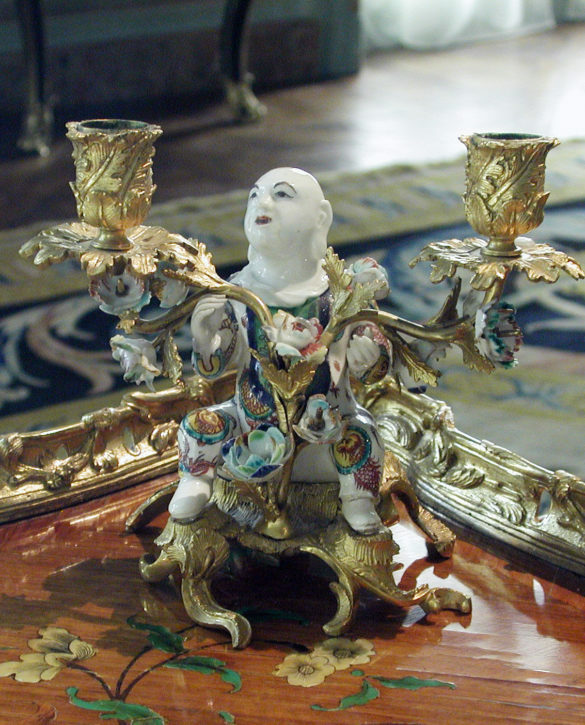 In 1745 the factory, under Charles Adam, Orry de Fulvy’s valet, was granted a twenty-year royal privilege to manufacture Meissen-style porcelain painted with figures and gilding. In 1753 the privilege was re-assigned to Eloy Brichard with Louis XV (1710-74) acquiring one quarter of the shares. The new Royal Manufacture (Manufacture du Roi) incorporated date letters with the royal cipher (interlaced ‘L’s) used earlier. In 1756 the operation moved to a purpose-built factory at Sèvres on the outskirts of Paris, where it remains in operation today. In 1756 the growing factory at Vincennes relocated to Sèvres, en route from Paris to Versailles, adjacent to Bellevue and the château of Madame de Pompadour (1721-64), the mistress of Louis XV and an important factory patron. In 1759 Louis XV purchased all the shares to support the factory’s innovative technical achievement and design. 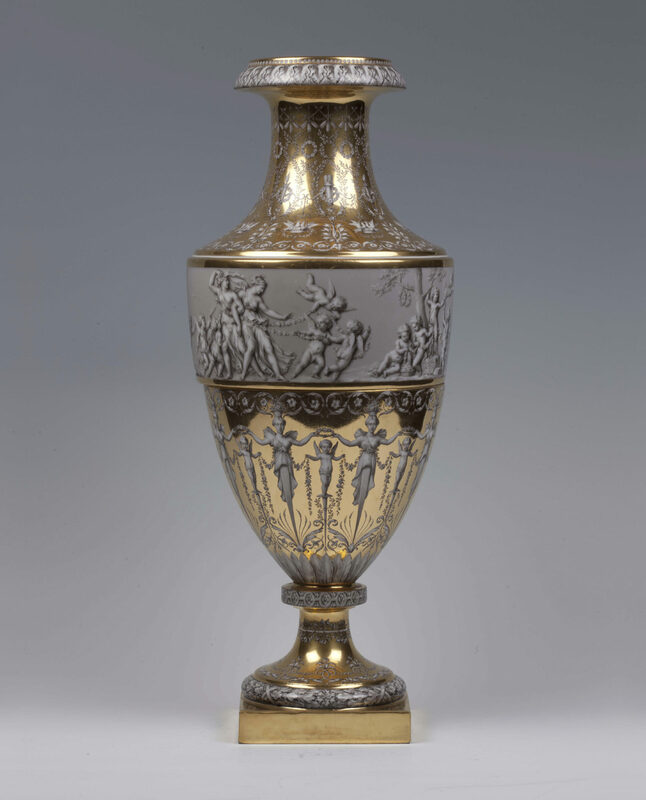 A goldsmith, Jean-Claude Duplessis (c. 1695- 1774), who had worked at Vincennes, was appointed as the artistic director of forms and his new designs in the rococo style shifted production away from Asian and Meissen imitations. These graceful and asymmetrical rococo shapes, based on natural forms, remained fashionable into the 1770s. Duplessis was also one of the leading designers of neo-classical shapes, first introduced by the factory in 1761. The factory was nationalised in 1793 following the abolition of the French monarchy. 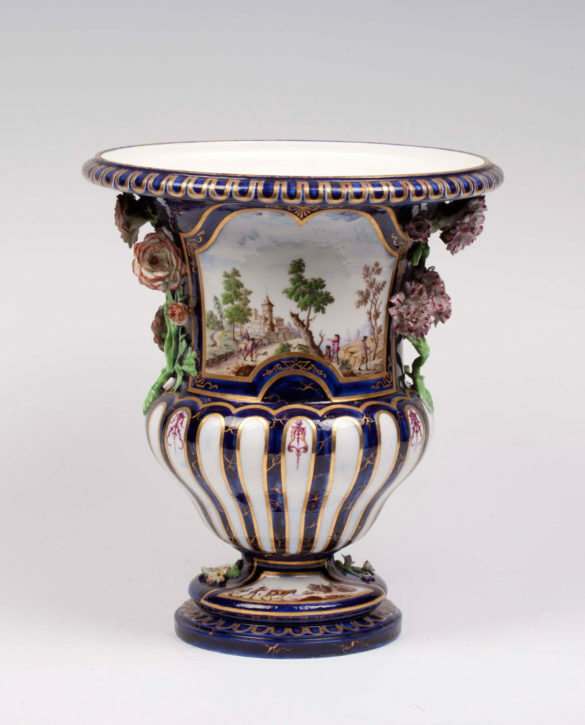 By 1737 François Barbin (c. 1689–1765) had established a soft-paste porcelain factory under the protection of Louis-François de Neufville, duc de Villeroy (1695–1766), on the duke’s estate at Villeroy. Barbin had been a Parisian merchant decorating and selling faïence and porcelain. In 1748 the encroaching monopoly of the crown-supported Vincennes factory forced Barbin to relocate his factory; by 1750, he had moved to Mennecy. In 1765 the factory was leased to Joseph Julien (1725–74) and Charles-Symphorien Jacques (c.1724–99), owners of a porcelain factory at Sceaux. In 1772 the factory was moved to Bourge-la-Reine, near Sceaux, where it ceased production in 1773. 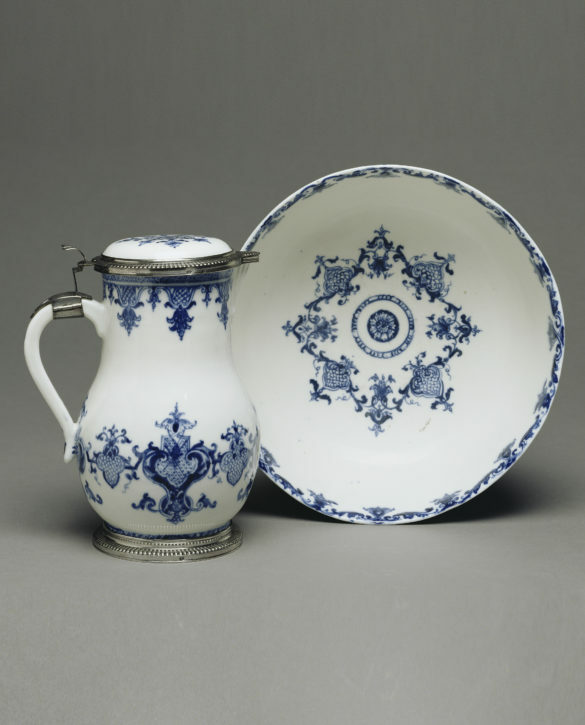 In 1765 a French source for kaolin, the essential raw material in hard-paste porcelain, was discovered near Limoges. In 1766 a royal decree relaxed prohibitions on porcelain factories to encourage development of this new material. However, the decree only allowed these factories to produce domestic porcelain, decorated in underglaze blue or a single enamel colour (en camaïeu), insisting factory marks be added. The Sèvres factory retained its royal patronage and exclusive right to produce sculptural, multi-coloured and gilded porcelain. Following the death of Louis XV in 1774, many French factories, under the protection of aristocratic patronage, openly disregarded these restrictions. Soon factories were established in Paris, including Dihl and Guérhard, Darte, Schoelcher, Nast, and Dagoty.